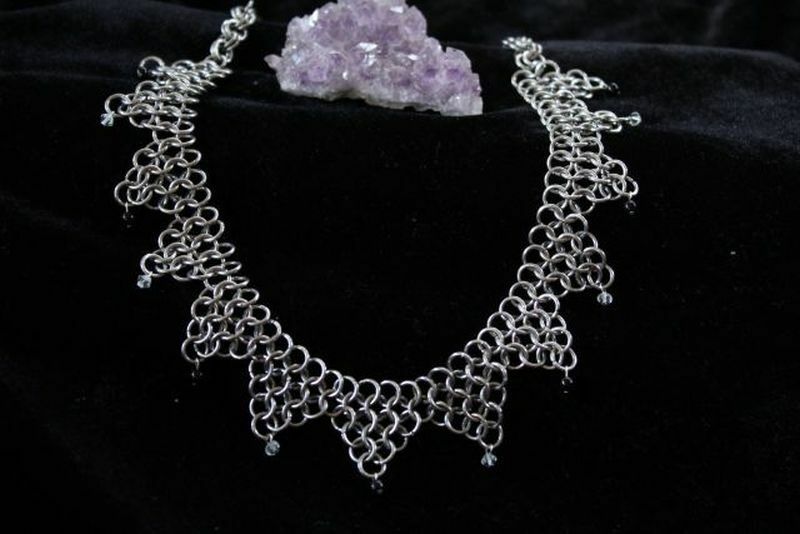 I have made so many necklaces out of chainmaille, it's always amazing to experiment with different weaves, patterns, stones and colors. I thoroughly enjoy "personalizing" necklaces for people, so custom jewelery is fun for me! The first necklace is completely hand made with aluminum. I added black jasper and swarovski crystals to give it extra glamor and shine. it took me about 3 hours to make. The next photo is a close up. 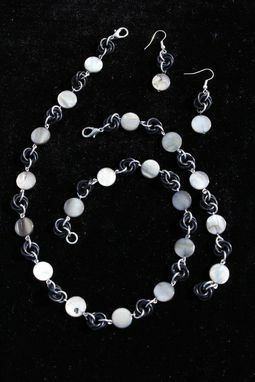 The second necklace (and matching bracelet and earrings) is hand made with black anodized aluminum and paua shell. 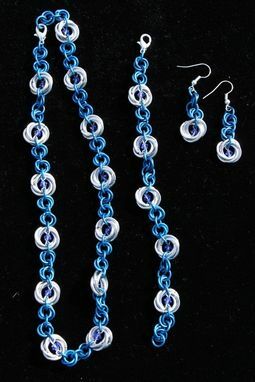 This one took me about an hour and a half for the necklace, and a little over 2 hours for the bracelet and earrings. 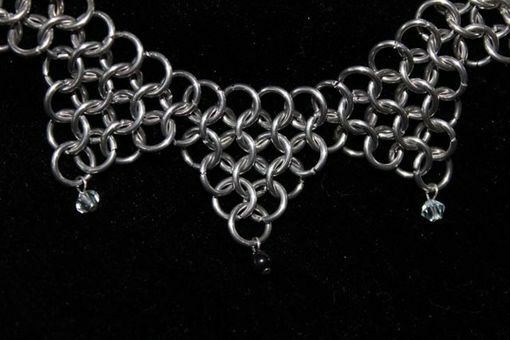 The third necklace is hand made with bare aluminum. 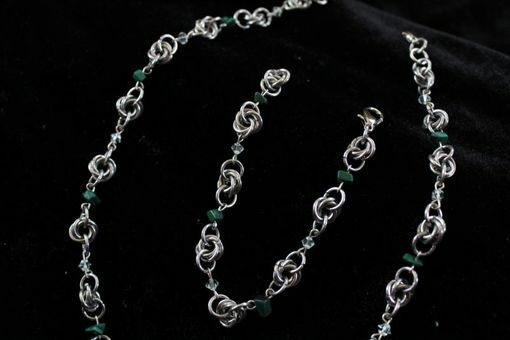 I also added malachite and swarovski crystals. The necklace took me about 2 hours to make. 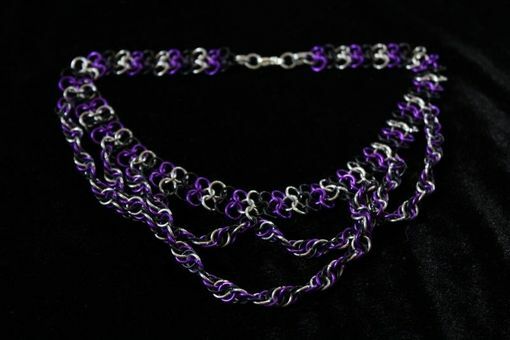 The fourth necklace is hand made with bare aluminum and black and purple anodized aluminum. I added some "hanging" spiral chains to a european 4-in-1 base and it looks great hanging on a neckline! This one took me about 3 hours to make. The fifth necklace is hand made with bare aluminum and blue anodized aluminum. I inset blue swarovski crystals and it's so dazzling! This particular design is one of my own! It took me about 2 hours to make. The sixth necklace is handmade with anodized aluminum, in 6 different colors. 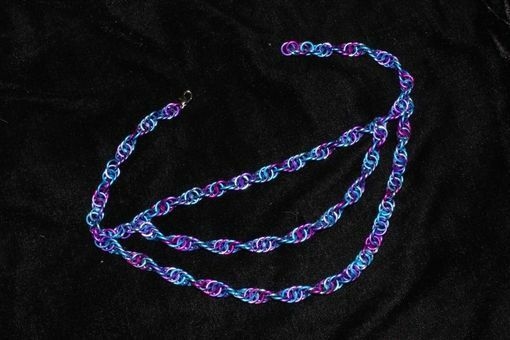 A friend of mine desired something that looked like "DNA" and this is what we came up with. It took me about 3 hours to make.